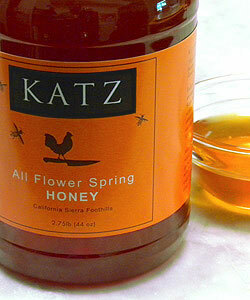 Each year we gather select lots of honey for our KATZ All Flower Spring Honey blend. The bees have been strategically placed in distinct areas of the lower elevation California Sierra Foothills to take full advantage of the amazing diversity of flora in bloom during the late spring and summer months. From these gatherings we select small lots for our restaurant chefs who are always searching to find a honey with distinct and bold flavors that can stand on its own when paired with a wide range of foods. The color of this year's selection is a light amber and the flavors are of sweet spices with a hint of apricot and vanilla, finishing with fresh cut hay. It has a great mouth feel and calls out to be used where the flavors can be highlighted…on cheese plates, in elegant dressings, drizzled over warm fruit desserts or crisps, spooned over grilled figs with some prosciutto and mint, or served with ice cream…yum! All of our Branches honeys are gathered directly from the hives and bottled unpasteurized, thus maintaining the multitude of health benefits associated with honey that are often lost in traditional commercial honey from overheating to eliminate crystallization.